Tai chi is an ancient Chinese martial art that descends from qigong, another age-old Chinese discipline that is rooted in traditional Chinese medicine. Some records state that tai chi dates back to at least 2,500 years. 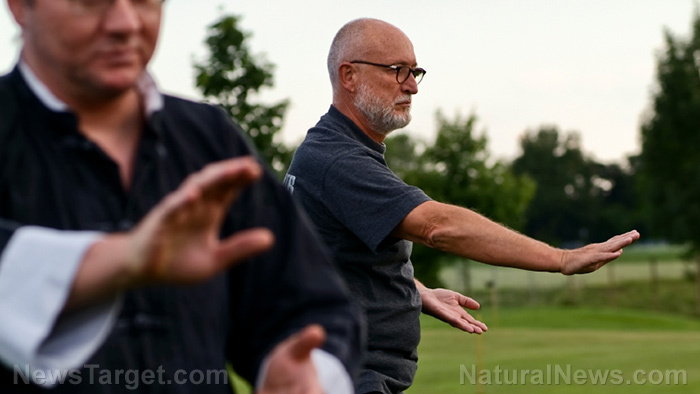 Tai chi involves a series of slow and meditative body movements that were originally used for self-defense and to help individuals feel inner peace and calm. There are even tai chi masters who are known for throwing an opponent to the floor easily with fast movements that are hard to see with the naked eye. These graceful movements use internal energy and movements too subtle for most people to observe, which reflects the idea that “four ounces can deflect a thousand pounds.” Tai chi masters can easily defend themselves using only a small amount of energy to neutralize an opponent using a far greater external force. In traditional Chinese medicine, humans are believed to be “miniature versions of the universe.” Like the universe, we are thought to be made up of the “constant interaction” of the five elements: metal, water, fire, wood and earth. These five elements can allegedly flow in an interrelated manner via all the organs of the body as the five phases of universal qi (pronounced “chee“). Qi is defined as the life force, or the intrinsic energy in the body that travels along meridians, or pathways in the body. A person is believed to be in a state of good health when the interactions between these elements let your qi flow in “a smooth and balanced manner.” Tai chi can help your qi flow smoothly. Qigong, the basis of tai chi, is a discipline that involves the mind, breath and movement to create “a calm, natural balance of energy” that can be used in work, recreation or self-defense. It can improve your mood and lower levels of depression, stress and anxiety. It enhances aerobic capacity and muscle strength. It improves energy levels and stamina. It enhances flexibility, balance and agility. It helps minimize incidences of falls. Improving falling and balance – Tai chi can help reduce falling and the fear of falling in older people. It can also be a more effective means of improving balance and stability in people with Parkinson’s disease. Easing knee osteoarthritis, fibromyalgia, chronic neck pain, and back pain – Practicing tai chi can help reduce pain and improve function more effective than an education and stretching program. Improves mental health and cognitive function – Research suggests that practicing tai chi can reduce stress, anxiety, and depression. It can also improve mood and self-esteem. Improves quality of life – Research suggests that physical activity, such as tai chi, enhances quality of life. Tai chi can also help reduce illness-related fatigue. Tai chi is an ancient Chinese martial art that descends from qigong, another age-old Chinese discipline that is rooted in traditional Chinese medicine. Tai chi involves a series of slow and meditative body movements that were originally used for self-defense and to help individuals feel inner peace and calm. Aside from being a meditative martial art, tai chi can improve your mood and lower levels of depression, stress, and anxiety. It enhances aerobic capacity and muscle strength. Tai chi supports several body systems by improving falling and balance. It can also ease knee osteoarthritis, fibromyalgia, chronic neck pain and back pain.